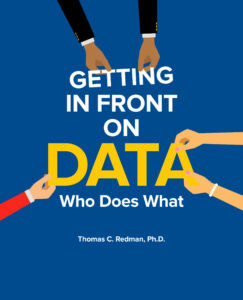 Getting in Front on Data, by Thomas C. Redman, Ph.D.
Tom Redman, “the Data Doc,” and his company, Data Quality Solutions, help leaders world-wide attack data quality head-on. Thousands benefit from his approaches and methods. Prior to forming Data Quality Solutions, he led the Data Quality Lab at Bell Labs. He has a Ph.D. in Statistics and two patents.